To forestall possible speculation that I'm not actually working or making anything original…. I'm currently working on a series of series of small pieces (yes, you read that right), designed to be hung as groups. The basic theme is The East Coast Trail and the foundations of the pieces are going to be my own photography, which I will over-stitch, paint and embellish as necessary. I've been meaning to work on this for some time now, but have never had the full concept gel the way it did last night. It's interesting how that happens sometimes. I was idly daydreaming about which hikes would be fun to do this summer and how I could incorporate our experiences into smaller, more spontaneous pieces that could then be marketed to other hikers and enthusiasts of the trail. My aim was to make original, attractive and evocative pieces that wouldn't be prohibitively expensive or drive me crazy with repetition. Also, they would have to be small and lightweight, so that travellers could transport them without difficulty. I popped out the trail maps and guides and made an inventory of highlights of the trail as we had see them and aspects of each section of trail that we've particularly like. I noted weather, season and time of day as factors that could be used to make pieces different or enhance atmosphere. I then did a quick survey of my photos and made notes of which ones I still need and which I have. The next step is to print out a set of four pictures and play with them. And go hiking. 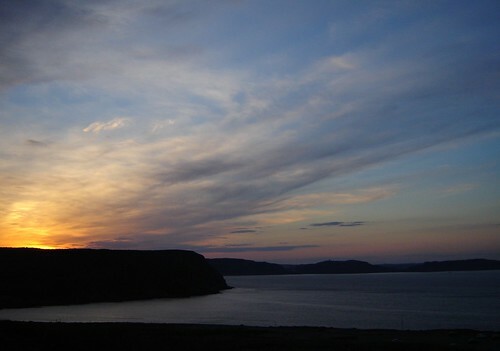 We have to get out on the trail again soon – I need more shots of Motion Head (near Petty Harbour). Oh what a beautiful image. I could get lost in that sky or just sit on the headland and ‘be’.